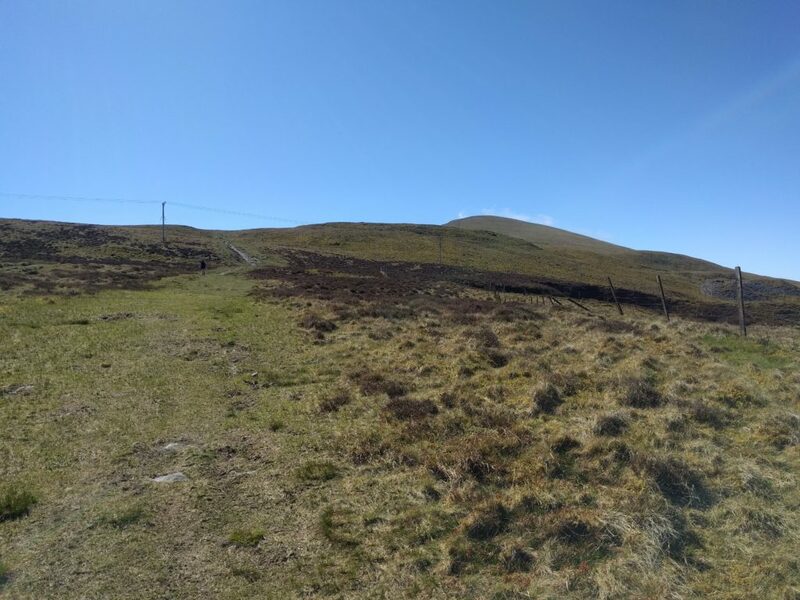 The early May Bank Holiday weekend this year has seen some unseasonably stunning weather, so it seemed a pity not to head to the hills and get a few more SOTA points. Moel Eilio is a 6-point hill in the shadow of Snowdon. Most people who operate from here do so by parking at the quarry and then taking the short walk up the hill from there. 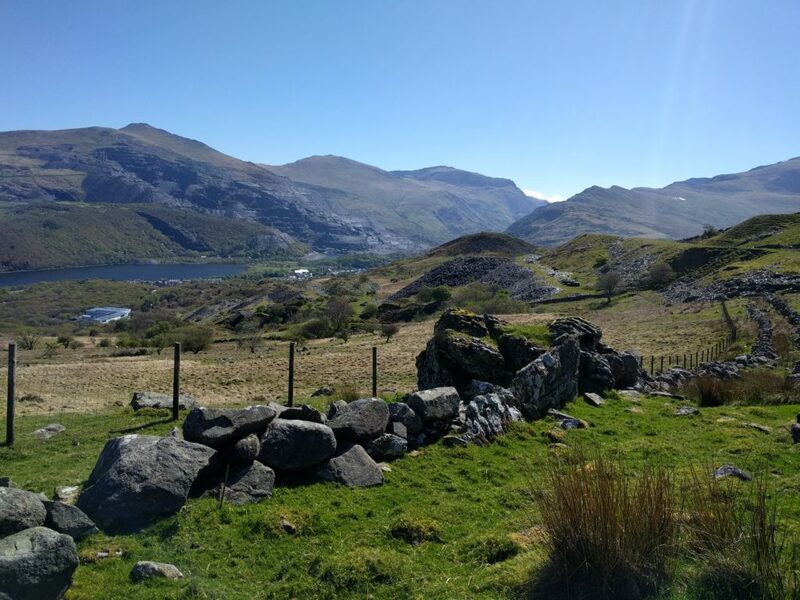 Somewhat foolishly, as it turned out, I decided that parking places would be at a premium on a glorious Bank Holiday weekend, and so I would get to Llanberis early, park there, and do the extra miles to walk up Moel Eilio from the town. One useful tip that I discovered while in Llanberis is that while parking around the main street is around £7-£8 per day, you can turn down the road beside the lake railway (signposted to Dinorwig Castle) and park just 200 yards down that road for a more reasonable £4 / day. Navigation is simple: From the High Street, you walk up Goodman Street, turning left onto the footpath through the trees at NGR SH 5682 6041. 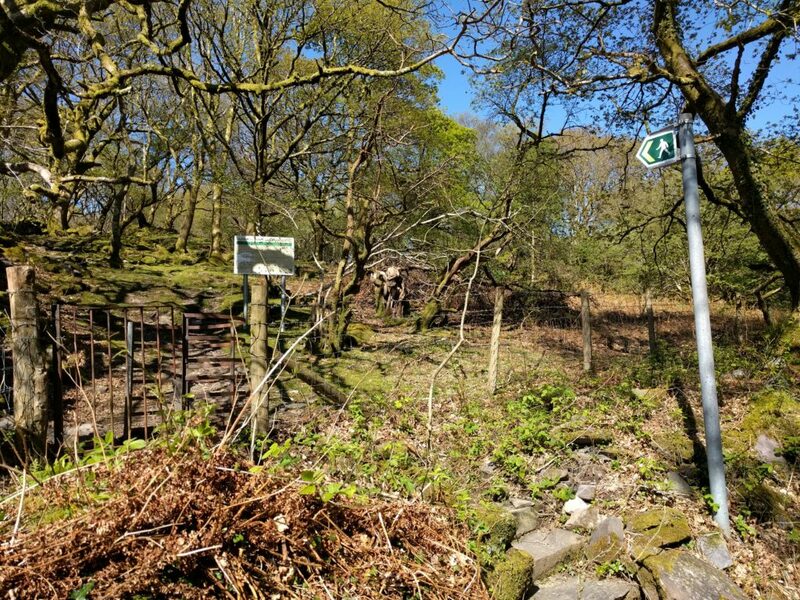 At SH 5648 6028, you come to a warning sign for the former quarry; go over the stile and continue along the path marked on the OS map. As suggested by the notice, the path here is through the old quarry workings and at one point it does go close to a steep drop and it is also a little boggy. It felt perfectly safe, however. Once you reach SH 5569 5994, you turn south to follow the obvious path along the fence directly to the summit. It’s a fair walk from the town, however, and the ascent took me about two hours. Once at the summit, there’s a very handy stone shelter, walled on three sides, which can be used to shield you from any wind. On a busy day like today, however, it was actually full of people eating their sandwiches. Using a bungee cord to attach by fibreglass pole to the wooden fence posts, I managed 7 QSOs on 30m CW, before heading back to the car in Llanberis the way I had come. The descent took around 1 hour 20. At the car, I dropped off the HF gear to save weight and just take my handhelds up my next target: the Llanberis path up Snowdon. 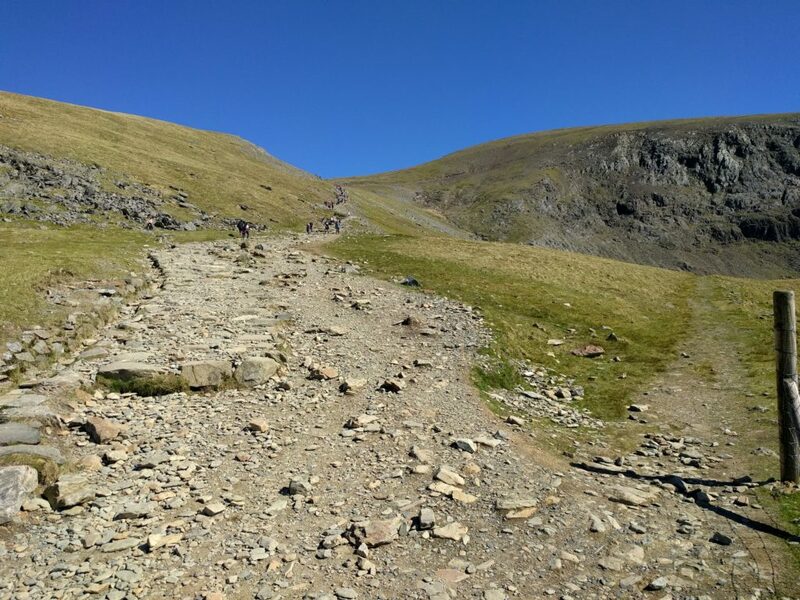 The Llanberis path up Snowdon is the longest but also least steep and for this reason it is also known as the ‘Tourist Path’. That was a very appropriate name today as hundreds, maybe even more, people were on the mountain — and that’s despite my climb not starting until 14:30, by which time I’d have imagined most would already be on their descent. 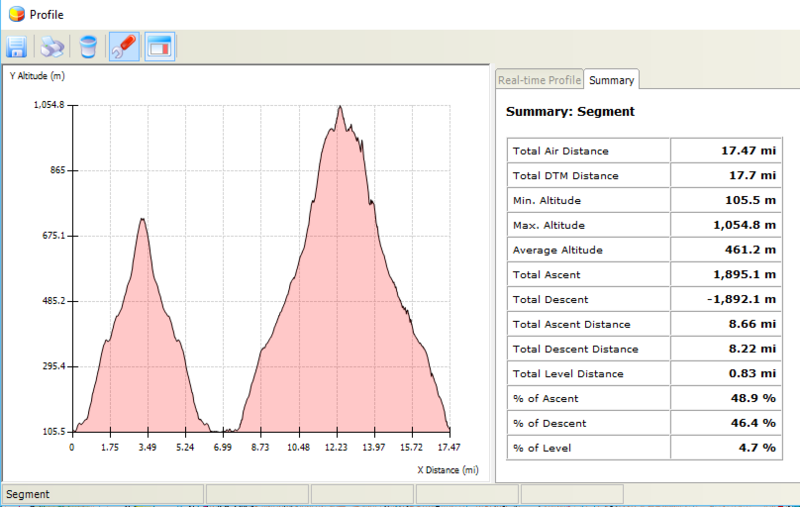 There really isn’t that much to say about the Llanberis path. You start walking on the road out of Llanberis to SH 5815 5892, where you follow a wide path, ‘paved’ with roughly cut stones, more-or-less following the train track up the mountain. The first half of the path is relatively gently inclining, becoming steeper as you approach the summit. There were plenty of young children and older adults reaching the top even on a very warm day, and it shouldn’t be difficult. I say ‘shouldn’t’ because on the latter stages of the climb, I managed to pull a muscle. I made it to the top and was able to successfully activate the mountain, but it made for a slow descent and a change of plans the next day. The ascent took me 2 hours 45 mins, and the descent took me 2 hours 10 mins, so still at the lower end of the 5-7 hour average time that’s often quoted for this route. 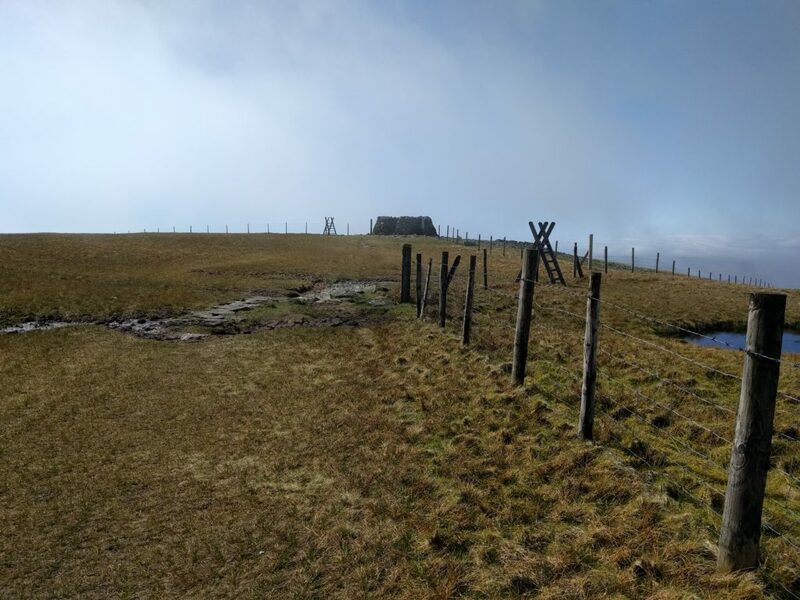 As implied above, there really isn’t space on Snowdon for an HF antenna at the best of times, and on a busy day like today it was always bound to be impossible. The summit itself is a pinnacle, almost always with loads of people on it, so I stopped just off the path just inside the activation zone to put out my calls. I quickly managed 4 QSOs on VHF from my handheld, including one contact with GW7HEM/M, who was on his way down the same mountain. This was also my first time on Snowdon with a view – it has always been shrouded in cloud on all my previous visits – so a very welcome change. Overall, this was a long day of hiking: 17.5 miles walked with nearly 1900m of ascent over the two summits. 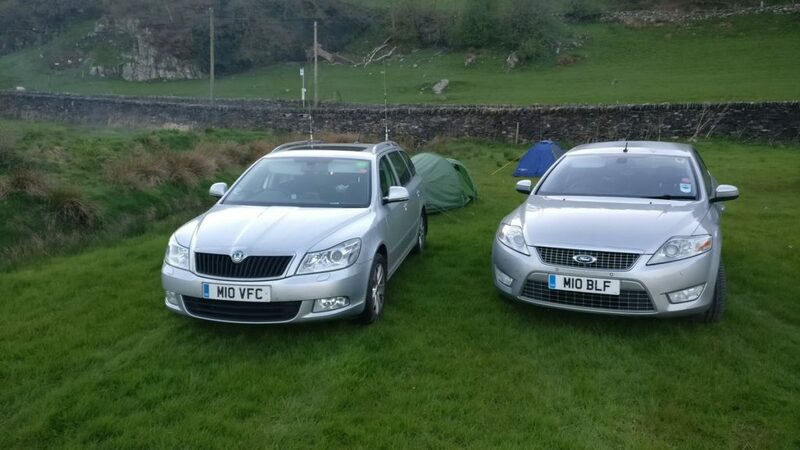 No wonder I was keen to get to the Dolgam campsite, where I had a reservation (and where, completely unexpectedly, I was joined by M0VFC, who was also on a SOTA activation in the area).